Ivy Tripp is the third album from Alabama native and former indie/punk rocker Kate Crutchfield, recording and performing as Waxahatchee. All of us have to, or have had to, go through the various stages of growing up, finding out who we are and becoming at peace with where we are at various stages of life. What Crutchfield brings to the table is a talent for looking critically at where she is and distilling pieces of it into well-formed songs. For me, the appeal is in the sincerity of the observations, the soaring but innocent-sounding vocals and the solid songwriting. The tempos vary from the more stately pace standard with singer songwriter work and crunchy rockers. While my personal taste favors that latter on this album (although the lovely ballad "Summer of Love" is my current number one), I think all of the songs are well-done and the balance among the various styles works well. My personal favorites are "Under A Rock", "Poison", "La Loose", "Air", "Grey Hair", and "Summer of Love". The album presents an intimacy and airiness with makes it appealingly accessible. We can understand Crutchfield, but we also and fell for her and cheer her progress. In the final analysis, this is an album to showcase the vocals and lyrical prowess of the artist, and she is more than up to the task in both respects. Crutchfield was assisted by Kyle Gilbride and Keith Spencer of the band Swearin' in recording Ivy Tripp, and all three share production credit. The album is out now via Merge Records on vinyl, CD, and as a digital download. We have some hot ones for you. How do we know they are hot ones? It says so right in the album title -- we aren't complete idiots here! 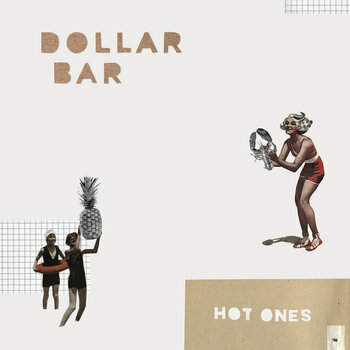 In our view, Hot Ones from Australia's Dollar Bar is a fulsome celebration of one of the most exuberant forms of rock music - lo-fi garage rock. It also reminds me of what it might be like to go to your local pub on Friday night, and have 16 conversations while consuming a comforting amount of beer. Some conversations are short, some are longer. Some are humorous, and some are sad. But there is plenty of embellishment and self-deprecation because, well, because beer. The soundtrack to the stories is garage and power pop, and you'll hear a bit of Guided By Voices, a bit of Weezer, a bit of Teenage Fanclub and perhaps a bit of Jonathan Richman. The stylistic diversity is the result of three distinct songwriting voices, just as if your pub excursion included three lubricated storytellers. And I have to love a band that once recorded a song titled "Cute Gurls Have the Best Diseases" (check it out on their Soundcloud page). Oh, did I mention that the album is a free download at the Bandcamp link below? Aren't these guys wonderful? Their fine label Sonic Masala Records also has vinyl packages available at the link. The wonderful and generous men of Dollar Bar are Chris Yates, Patrick McCabe and Dale Peachey, and their impeccable drummer Brendan Rosen. Hot Ones is their third LP. We like JUNK here at WYMA. It started with our feature of their promising debut EP Car last June (here), and our admiration has only increased with their new release "Dirt In My Eye". The song is from their next EP, Liquorice, which is out on CHUD Records in May. Garage/punk with veins of melody -- one of the best ways to start your day! JUNK are a York, UK-based trio consisting of Estella Adeyeri (vocals/guitar), Sam Coates (vocals/guitar), and Danny Barton (drums). American Wrestlers is mid-30s Scotland native and Missouri resident Gary McClure. Formerly, he was a member of Working for a Nuclear Free City, as well as releasing an album under his own name. He moved to the United States a few years ago, and while working a day job, he has been writing music and recording at home with analog equipment. His approach to marketing has been to send out tracks under the name American Wrestlers, with little or no background information. The songs obviously have connected with many recipients, and while the mysterious source may have contributed, I am of the opinion that the songs have earned him the attention he now is getting. With McClure playing all the instruments (including pushing the button on the drum machine), he has prepared an eight-song American debut LP for Fat Possum. Steadfastly lo-fi and with a bit of a psychedelic swirl, it is, to my ears, timeless guitar pop. Guitar pop crafted to please the ears with melody and sound, and please the mind with carefully thought-out lyrics. It seems to me that it is the kind of music that a gifted musician makes when he is writing and recording to please himself, with at most a hope that anyone else will want to listen. But McClure has also said that he understands that once the song is recorded and pressed in vinyl, it is immutable. So he takes great care in the process. The songs are warm, if not always thematically easy, and what McClure's recording process yields in terms of fidelity it gives back in terms of immediacy and accessibility. The songs aren't just set out there for you to purchase, they are shared with you. For me, the standout tracks are "There's No One Crying Over Me Either", "I Can Do No Wrong", "The Rest of You", "Kelly" (a beautiful song about a tough subject), and "Cheapshot". Yes, I know that that is over half the songs, but this album has gotten a bit under my skin, and it feels pretty good there. We hope Mr. McClure keeps at it, because we want to hear what he has to say. In the interest of full disclosure, I note that I am an American, and I was a wrestler in high school. 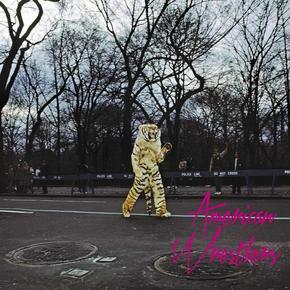 American Wrestlers is available on vinyl, CD, cassette and as a digital download. If you are interested in the New Zealand pop music scene of the '80s and early '90s, The Jean-Paul Sartre Experience probably is on your list of bands to investigate. If you were a fan back in the day, you probably regret your copies disappearing when that jerk of a former roommate moved back to the parents' basement. And if you have tried to find/replace their music, you probably have discovered that their three LPs and several EPs are hard to find, and very expensive to acquire if found. Fortunately, Fire Records is coming to the rescue. 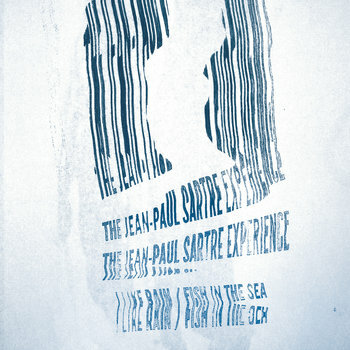 Later this year, the label will release a comprehensive box set I Like Rain: The Story of the Jean Paul Sartre Experience. Although you'll have to wait a few months for that compilation, you can whet your appetite with the just released two-track single "I Like Rain", in which the band's first single dating from 1987 is paired with "Fish In The Sea", taken from their first 12" release. The title track can be streamed below, and a captivating pop tune it is! And to further sell you on this one, here is a stream of the B-side, which is a bit more experimental, but even more interesting in its own way. Are you confident enough in yourself to admit that sometimes bubblegum and glam sound really, really good? Yes, I thought you were. So we present John Krautner's Fun With Gum Vol. 1. The Detroit rocker is a veteran of The Go and Conspiracy of Owls. For this outing he has enlisted the assistance of Ben Luckett, Steve Nawara, and Justin Walker, and together they channel AM-worthy gooey tunes and crunchy chords. This isn't the kind of music ones discusses at length; this is music that you just play while sitting back and with a big smile on your face. You can stream the entire LP below. If you only have time for two, I recommend "I Can Cry Too" and "Lion Eyes". The little hidden gem here is the 'Vol. 1' designation. Dare we think this means there will be more fun with gum in the future? Fun With Gum Vol. 1 is out today on Burger Records on cassette, CD, and vinyl. Digital downloads are available from iTunes and Amazon. Apparently, Mr. Darnielle was a fan of professional wrestling growing up, and was enthralled and entertained by the good versus evil presented by the athletes. While Beat the Champ is more about the wrestling John (and from time to time, this writer) watched in his youth than the current version, it is no thumbnail history of sport. In the adept storyteller's hands, impressions of the wrestlers' lives and motivations, challenges and hardships, dangers and triumphs, are woven with other details of life both large and small in scope, and washed with the colors of mythology. It is a vividly drawn work, and you can hear the crowd, smell the sweat, feel the fear, sense the desperation -- just consider the song titles, including "Stabbed Outside of San Juan" (about a real incident), "Choked Out", "Heel Turn 2", "Hair Match", "Animal Mask", "The Ballad of Bull Ramos", and "Werewolf Gimmick". More importantly, you can feel the appreciation of, and even need for, heroes; heroes whose imperfections and out-of-the-ring failures are irrelevant when they don their costumes and play out the muscular theater of pro wrestling. The professional wrestling of Darnielle's youth may be gone, but Beat the Champ is like an aural version of a graphic novel for the sport, and for exploring life. Jump into the ring -- is is thrilling, exciting and, most of all, sounds wonderful. The Mountain Goats, in addition to John Darnielle, are Peter Hughes and Jon Wurster. Beat the Champ is out today on Merge Records. We know of Mac McCaughan as a frontman for Superchunk, as well as co-founder of Merge Records. But he is on the page today in his third guise as solo artist, Mac McCaughan. Solo Mac has an album title Non-Believers scheduled for release on May 5. And just to make sure you care about that, he is releasing a single edit of album track "Box Batteries", paired with "Whatever Light". The title track is an upbeat slice of lo-fi, GBV/The Clean indie rock with a few streaks of punk. It makes me feel young, and I'm growing to like that in my music. The single hits the streets tomorrow via Merge, and limited edition 7" versions will be available at certain records stores and from Mac on tour. The Tamborines are Brazilian male-female duo Henrique Laurindo (guitar/vocals) and Lulu Grave (drums/vocals). Based in London, their latest release is the 11-track Sea of Murmur, and offers melodic power pop with obvious conviction and, when appropriate, serious volume (e.g. "Black & Blue", "Slowdown", and "Dreaming Girls"). Thematically, the album dwells in the melancholy register with sharp looks at love and life, which is no surprise when you learn that it was written as the personal relationship between the players was disintegrating. But the beautiful melodies anchor the songs and render a warm-sounding and coherent set of songs. 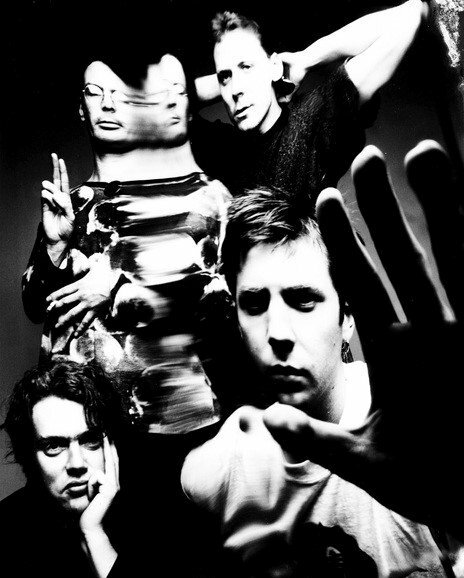 The style varies from the psychedelic-tinged folk rock of "Another Day" to the My Bloody Valentine noise levels of "Black & Blue" to the Teenage Fanclub-like feel of tracks 3-8, including "Ghost At The Lighthouse", Fellini's Thorn", and "Said The Spider To The Fly". Sea of Murmur should prove a very satisfying listen for power pop fans, especially those that like a wistful and melancholy tint. You can stream the entire album at the Bandcamp link below, which probably also is the best source for purchase. Sea of Murmur is available in vinyl, CD and digital formats via the band's own Beat-Mo Records.